Check here for previous PGLA Events! Brethren, The Stated communication of the Provincial Grand lodge will be held in the Hilton Hotel Templepatrick. A stated Communication of the Grand Lodge of Ireland will be held in the Lough Rynn Castle, Mohill, County Leitrim on Thursday 7th March 2019 at 2:30pm. The History Hub Ulster are holding a Talk and Tour regarding the Bank Buildings in Arthur Square Hall at 1 pm on Tuesday 19th March 2019 - all welcome. The History Hub Ulster are holding a Talk and Tour regarding the Bank Buildings in Arthur Square Hall at 1 pm on Tuesday 19th March 2019 – all welcome. 21mar8:00 pmCary & Dunluce Charity Committee MeetingThursday 21st March 2019 at 8pm in Ballycastle Masonic Hall. Brethren, The next meeting of Cary & Dunluce Charity Committee will be held on Thursday 21st March 2019 at 8pm in Ballycastle Masonic Hall. Brethren, Provincial Grand lodge of Antrim - Board of General Purposes will be held on Monday 25th March 2019. Time and Location to be confirmed. 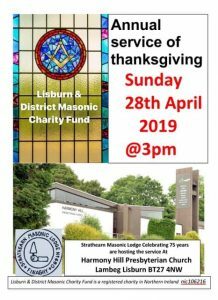 Brethren, Provincial Grand lodge of Antrim – Board of General Purposes will be held on Monday 25th March 2019. Time and Location to be confirmed. 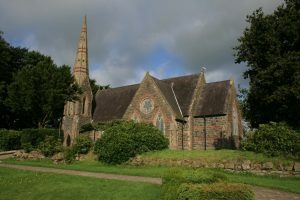 Six Mile Valley & District – Sunday 7th April 2019 at 3.30pm in Kilbride Parish Church. Provincial Grand Lodge of Antrim - Special Communication will be held on 11th April 2019 - 3pm at the Tullyglass Hotel, Ballymena. Provincial Grand Lodge of Antrim – Special Communication will be held on 11th April 2019 – 3pm at the Tullyglass Hotel, Ballymena.